The Ryal Coat o Airms o the Unitit Kinrick is the offeecial coat o airms o the Breetish monarch, currently Queen Elizabeth II. Thir airms is uised by the Queen in her offeecial capacity as monarch, an is offeecially kent as her Airms o Dominion. Variants o the Ryal Airms are uised by ither members o the Ryal Faimily; an by the Breetish Govrenment in connection wi the admeenistration an govrenment o the kintra. 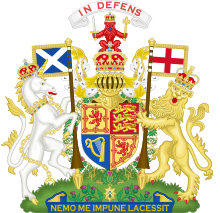 In Scotland, the Queen haes a sindry version o the Ryal Airms, a variant o it is uised by the Scotland Office. 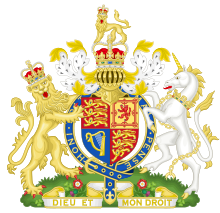 Wikimedia Commons haes media relatit tae Royal coats of arms of the United Kingdom. This page wis last eeditit on 3 Mairch 2018, at 19:48.